Catalogue > Maps Europe > France. 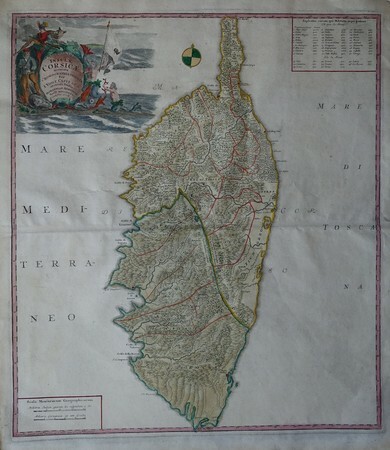 Corsica. Insulae Corsicae accurata Chorographia tradita (...). Old, antique map of Corsica. Upper left corner cartouche with title, date, the name of the cartographer, I. Vogt and the imprint of the Homann Heirs. Line-scales in the lower left corner. Verso Latin text. A few thin spots in the paper. Otherwise excellent. Col. copper engraving, published in Nuremberg in 1735 by Homann Heirs. Height 56.2 centimeters; width 49.5 centimeters.